An estimated 1.8 million children are living with HIV. 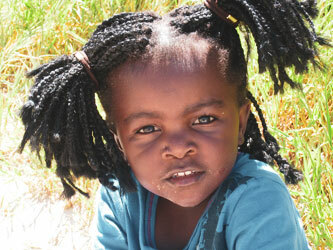 Children aged 0 – 4 years who are HIV-positive are more likely to die than any other age group living with HIV. Only 42% of affected children have access to life-saving HIV treatment – Anti-Retroviral Therapy (ART). One to One Children’s Fund interventions focus on community-based HIV prevention, healthcare and support for children living with the condition. We identify children as early as possible to ensure they receive treatment, care and support so they can live and thrive. Children living with HIV are less likely to receive ART than adults and without this treatment, one in three HIV-positive children die before their first birthday. Too often children are not tested or treated because of the enormous fear and stigma which keeps parents from seeking testing and treatment for themselves, and their children. Our programmes ensure that children access quality treatment and child-friendly care in both health facilities and their communities. By visiting patients at home, our community health workers (CHWs) give children and families support in a comfortable setting where they feel safe. CHWs reach people who might be unable to attend clinics due to the distance and costs involved in travelling and engage the whole family, which is difficult to do through a clinic but is hugely beneficial for the child. We also work closely with local partners and clinics, allowing them to identify what we can do to provide the most crucial support them. There is mounting evidence that 70% of children who live in HIV-affected households experience developmental delays. Early childhood is a critical stage of development for children’s future learning and wellbeing. This project is delivering early childhood development support to young children and families affected by HIV.